The Maldivian Democratic Party’s (MDP) parliamentary group has decided that it will not be supporting the budget oversight committee’s version of the 2015 budget. The opposition has issued a three-line whip compelling all party members in the Majlis – currently numbering 23 of the 85 seat house – to oppose the current version of the record MVR24.3 billion (US$1.5 billion) state budget. A report was approved by the budget oversight committee last week for consideration of the full house, recommending no changes to the spending plans. MDP internal committees have branded the budget “aimless”, inadequate, and conducive to corruption since it was first submitted by Minister of Finance Abdulla Jihad last month. The introduction of 10 percent import duties on oil and essential foodstuffs is part of the government’s plans to generate MVR3.4 billion (US$220 million) in new revenue – representing 14 percent of the 2015 budget. The MDP’s budget committee has expressed concern that failure to meet the proposed revenue raising measures could see the budget deficit increase to MVR5 billion (US$330 million), from the estimated MVR1.3 billion (US$84 million). Further plans included revisions to current electricity subsidies, as well as the introduction of a US$6 ‘Green Tax’ on tourism, which the MDP has suggested was originally budgeted for US$10. While government officials have said that the new tax will be used to resolve the country’s waste management problems, pro-government MPs have refused to ring-fence the additional revenue. The MDP’s parliamentary group’s decision to issue the three-line whip was made during a meeting on Sunday evening, although only 9 MPs attended the meeting. Party discipline has been brought into question on numerous occasions during the MDP’s first year in opposition, most notably in the approval of all 15 of President Abdulla Yameen’s cabinet last December, after 6 MDP members ignored instructions to reject 8 nominees. Fahmy also explained that the recent approval of Hassan Ziyath to the post of auditor general was against the spirit of the parliamentary group after it had strongly opposed amendments to the Auditor General’s Act. MDP members contributed 9 out of 59 votes in favour of Ziyath’s appointment. “MDP MPs in the independent institutions committee boycotted the committee and walked out after making a statement there to say that reappointing an auditor general is unconstitutional,” said Fahmy. The Maldivian Democratic Party (MDP) hascondemned President Abdulla Yameen’s government for its lack of commitment to promises made towards the betterment of fishermen and farmers in the Maldives. While speaking at a press conference, MDP Fisheries and Agriculture Committee’s Chair Ibrahim Rasheed said that the government’s lack of commitment is clearly illustrated by the fact that no funds are allocated towards the promised MVR10,000 (US$650) for fishermen. “Even though President Yameen has promised on multiples podiums to provide fishermen with MVR10,000 and farmers with MVR8000, the budget does not have any allotted funds for this,” said Rasheed. The committee also expressed concerns over the high recurrent expenditure budget allotted for the fisheries and agriculture ministry while there are only three new programmes to be added to the few ongoing in the upcoming year. 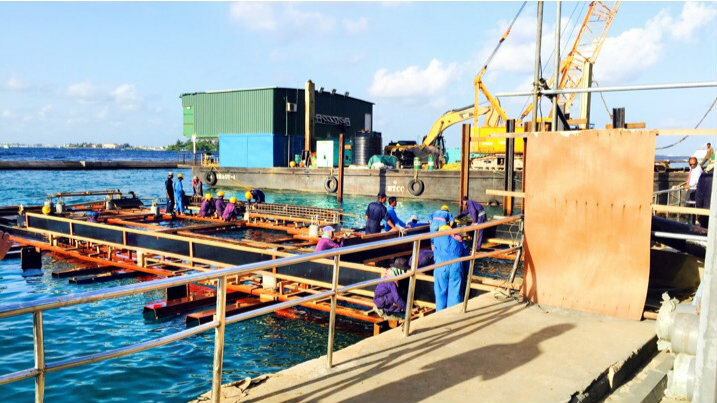 The record24.3 billion (US$ 1.5 billion) budget for 2015 has an allotted MVR134 million (US$8.7 million) as recurrent expenditure for the Ministry of Fisheries and Agriculture. Meanwhile, the parliamentary debate for the proposed budget concluded today with 79 out of 85 MPs sharing their thoughts on the budget during the process. The Maldivian Democratic Party (MDP) has heavily criticised the proposed housing budget for the year 2015 for lacking clarity and new projects aimed at providing adequate housing. While speaking at a press conference today, MDP housing committee chair and former environment and housing minister Mohamed Aslam said that the funds allotted towards housing projects for the upcoming year were for projects initiated by the MDP government elected in 2008. The record MVR23.4 billion (US$ 1.58 billion) proposed budget – currently under discussion at the parliament’s budget committee – has MVR1.4 billion (US$90 million) allotted to the Ministry of Housing and Infrastructure, of which MVR83 million (US$5.3 million) is recurrent expenditure. The MDP housing committee noted issues in the 2015 budget such as the inclusion of a feasibility study of the proposed Malé-Hulhumalé bridge for the years 2015, 2016, and 2017. The committee also brought up issues with a budgeted land reclamation project at Gaaf Dhaalu Thinadhoo, saying that the project has been ‘unnecessarily’ dragged on until 2017. The land reclamation project in question has an allotted MVR9.8 million (US$635,000) for the years 2015 and 2016 while the actual MVR168 million (US$11 million) required for the land reclamation project has been delayed until 2017. Previously, the MDP budget review committee described the overall 2015 budget as ‘aimless’ and as serving administrative purposes alone. The Maldivian Democratic Party (MDP) transportation committee has said that the proposed 2015 state budget does not give adequate importance to transportation. While speaking at an MDP press conference today, the Committee’s Chair Dr Ahmed Shamheed said that the government has failed in fulfilling its manifesto which states that providing cheap, effective, and speedy transportation as one its aims. “Even though the government recently announced that it has achieved 90 percent of the goals outlined in its manifesto, not even 1 percent of the transportation related goals have been achieved,” said Shamheed. Shamheed noted that the Progressive Party of Maldives (PPM) in its manifesto outlined that it would finish up the ongoing regional airport development projects. However, He said that no regional airports have been opened in the last year. President Abdulla Yameen recently revealed plans of developing an airport in the north at Haa Dhaalu Kulhudhuhfushi in the upcoming year. The government has secured a preliminary agreement for the development of Ibrahim Nasir International Airport, with the cabinet revealing recently that the Beijing Urban Group and Maldives Airports Corporation Limited had finished the drawings of the airport and were in the process of submitting the proposal to China’s Exim bank in order to finance the project. Plans for the ambitious Malé-Hulhulé bridge project were also said to edging closer to realisation as a Chinese team visited the Maldives to conduct a preliminary survey this month. While the record MVR24.3 billion (US$1.5 billion) proposed budget for the upcoming year allotted MVR63 million (US$5 million) for regional airports under the tourism ministry, it is unclear whether the amount is for recurrent or capital expenditure. Also speaking at the press conference, MDP transport committee member Ahmed Zahir said that the atoll ferry system introduced during MDP’s government is currently in turmoil as the government does not prioritise development of the ferry system. “The transportation systems in the atolls are being destroying and I am afraid that it might go back to the old days where the inter-atoll transportation was monopolised by individuals with boats,” said Zahir. The MDP committee also slammed the government for budgeting expected revenues from increasing the import duty on vehicles and fuels, stating that the measures would have a significant impact on the guest house industry as travelling costs within the country would increase severely. Previously, MDP’s education and training committee claimed that the funds allocated for education in the budget were poorly prioritised and would lead to corruption. Additionally, the MDP budget review committee stated that the budget is ‘aimless’ and serves only administrative purposes, suggesting that programme budgets submitted during the MDP government were part of a strategic action plan aimed at fulfilling the party’s promises. President Abdulla Yameen dissolved the Ministry of Transport and Communication in July, transferring regional airports to the Ministry of Tourism and the Transport Authority to the Ministry of Economic Development. The move came shortly after the dismissal of Transport Minister Ameen Ibrahim following break down of the election-winning coalition of the Jumhooree Party – of which Ameen is a member – and the PPM. Finance Minister Abdulla Jihad has sent the 2015 projected annual state budget to the People’s Majlis for approval. While speaking to local media outlet Sun Online, Jihad said that the budget was sent to the parliament last Thursday and that it would be higher than the budget for the year 2013. The estimated budget for the current year was set at a record MVR 19.95 billion (US$ 1.16 billion). At the time the budget deficit stood at MVR 1.3 billion (US$ 84.3 million). Jihad revealed in August that the government’s spiralling deficit could leave it unable to pay the salaries of civil servants. The World Bank warned the government in late 2013 that it was spending well beyond its means noting that some of the biggest expenses were high civil service wages bill, healthcare, and electricity subsidies and transfers to state owned enterprises. A report released by the World Bank stated that the budget deficit at the time at 81 percent of the GDP was unsustainable and predicted that the deficit could rise to about 96 percent by the year 2015. The President’s Office (PO) spent MVR30.6 million (US$1.9 million) in excess of the approved budget in 2011 while MVR2.8 million (US$181,582) was used to cover expenses that were not directly related to the office’s mandate, the PO’s audit report (Dhivehi) has revealed. Among the unrelated expenses were MVR1.8 million (US$116,731) spent on trips by former President Mohamed Nasheed to 88 islands ahead of the February 2011 local council elections, MVR904,855 (US$58,680) spent for then-Vice President Dr Mohamed Waheed to stopover in Singapore after attending the “Third Symposium on the European Academic Space” in Italy, and MVR139,676 (US$9,058) spent on a trip by the PO to check progress on the editing of ‘The Island President’ documentary. While MVR526,454 (US$34,140) was spent for two trips to the United States by the vice president and his family, the report made public yesterday noted that there were no details of expenditure for MVR364,267 (US$23,623) of that amount. Moreover, MVR235,556 (US$15,276) was spent out of the vice presidential residence’s budget for the vice president, his wife, child, and father to make the Hajj pilgrimage, but there were no details of expenditure for MVR60,524 (US$3,925) spent on food and accommodation. “And while MVR69,112 (US$4,481) was spent for medical treatment during a trip by the vice president and his wife to Singapore in 2011, no documentation concerning the medical treatment was submitted,” the report stated. Similarly, the report noted that MVR462,326 (US$29,982) was spent to cover the medical expenses of the president’s family in 2011, but were no documents related to the medical expenses. A total of MVR677,369 (US$43,927) was meanwhile spent in 2011 on holidays for the president’s family, the report revealed. Auditors also found that the PO paid mobile phone bills for political appointees out of the office’s budget in the absence of either a ceiling limit or rules to determine whether the calls were made for official purposes. While MVR187,397 (US$12,152) was loaned from the PO budget to political appointees for personal expenses, auditors found that MVR184,191 (US$11,944) had not been repaid. Moreover, MVR51,669 (US$3,350) was spent out of the vice presidential residence’s budget to pay mobile bills of the vice president’s wife, Madam Ilham Hussain, in contravention of the law governing privileges and state benefits for the vice president. While the law stipulates that security for the vice president and his family must be arranged by the Ministry of Defence and National Security, auditors found that travel expenses for bodyguards during unofficial overseas trips by the vice president and his wife were settled out of the vice presidential residence, Hilaaleege’s budget. Among other cases flagged in the report, auditors found that the PO had to pay MVR555,808 (US$36,044) as compensation to Shady Cabin after screws and sponges from 170 rented chairs went missing. The chairs were rented for the SAARC summit held in Addu City in November 2011. The PO also covered expenses for foreign dignitaries out of its budget in the absence of rules for hospitality, the report noted. Auditors found that MVR294,037 (US$19,068) was spent out of the presidential residence Muleeage’s budget for the stay of two British citizens from February 16 to 23. Moreover, MVR29,058 (US$1,884) was spent out of the Muleeage budget for the “son of the president of a neighbouring country” to stay in a resort. Auditors also discovered that there were 25 cable TV decoders in Muleeage and 12 decoders in Hilaaleege, for which MVR174,080 (US$11,289) and MVR81,917 (US$5,312) respectively was spent in 2011. Lastly, auditors found that the PO did not maintain inventory records in accordance with public finance regulations. Plots of land and buildings under the care of the official residences of the president and vice president as well as fittings, furniture, and vehicles were not valued and included in the asset register.